Every week we pull together some great Canadian recipes from Canadian food bloggers around the web featuring one main ingredient or dish. This week we share our ultimate blueberry recipe guide - over 70 juicy blueberry recipes. Blueberries with their pop of vivid colour add a little extra sweetness to everything they touch. They're Mother Nature's candy - and they pack a healthy punch! Add them to muffins and cakes, top your granola, toss in your salads, puree them, jam them, bake a pie. Make a simple syrup, have a cocktail, turn them into BBQ sauce, slather meat and fish with a blueberry glaze, pickle them, blend them into a smoothie or milkshake. Freeze them and savour them all year long. Is there anything this tiny little berry can't do? We don't think so. And here's over 70 blueberry recipes from all across Canada to prove it! Enjoy! A refreshing **[Blueberry Lemon Cucumber Gin Mojito](http://myislandbistrokitchen.com/2016/09/04/blueberry-lemonade/)** is just the ticket to unwinding in a hammock or on a patio this summer. From **Justine Celina**. You're never to old for a popsicle especially when they're **[Blueberry Chai Creamsicles](https://www.thesimplegreen.com/single-post/2017/06/25/BLUEBERRY-CHAI-CREAMSICLES)**! From **The Simple Green**. If you grew up with a Ukrainian grandma then you know that pirogies aren't just savoury. There's also dessert perogies, usually filled with homemade preserves like blueberry or apricot. Try making your own with these **[Blueberry Perogies with Blueberry Sour Cream Sauce](https://cookswithcocktails.com/blueberry-perogies-with-blueberry-sour-cream-sauce/)**. From **Cooks With Cocktails**. This gorgeous, vegan **[Silky Raw Blueberry Cashew Cake](http://www.ehvegan.ca/silky-raw-blueberry-cashew-cake/)** will be a stunner at any summer get together and make all your guests think you're a genius! From **Eh Vegan**. Blueberries are an exceptional compliment to pork and when you can have a dish ready in 10 minutes like these **[10 Minute Blueberry Pork Chops](http://www.pureandsimplenourishment.com/blog/2016/08/10-minute-blueberry-pork-chops.html)**... well that's a winner in our books! From **Pure and Simple Nourishment**. Pickled fruit is a great accompaniment to savoury dishes or a charcuterie and cheese board. This quick pickle **[Pickled Blueberry recipe](http://www.baconismagic.ca/loka-snacks/pickled-blueberry-recipes/)** is a great and easy way to try your hand at pickled fruit! From **Bacon is Magic**. When you put two purple summer fruits together you're going to make delicious things. Scoop up servings of **[Muscavado Blueberry Plum Sorbet](http://www.simplebites.net/muscavado-blueberry-plum-sorbet/)** for everyone! From **Simple Bites**. Salty feta cheese with sweet blueberries make for a **[Feta Cheese and Blueberry Scone](http://www.littlesweetbaker.com/2017/07/07/feta-cheese-blueberry-scones/)** that can be sweet or savoury depending on your mood! From **Little Sweet Baker**. This rainbow of a salad will brighten up any picnic or BBQ. **[Broccoli Cauliflower Blueberry Coleslaw](https://www.theendlessmeal.com/broccoli-cauliflower-blueberry-coleslaw/)** has textures, colour, and most importantly, tangy sweet flavour! From **The Endless Meal**. Meringues are one of those desserts that are surprisingly easy to make given how elegant they look. Fill them up with tangy, sweet blueberry curd and you have **[Blueberry Meringue Kisses](http://bethdunham.ca/updatesnews/2016/4/11/blueberry-meringue-kisses)** perfect for afternoon tea or a sophisticated dessert. From **Beth Dunham**. Blueberries pack a healthy punch - they're a great addition to the start of your day. Click on the photo to go to the recipe. Classic blueberry muffin recipes - click on the photos to go to the recipes. Kick your morning off right with one of these healthy blueberry smoothies! Click on the photos to go to the recipe. 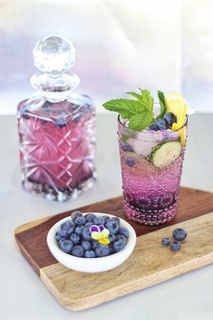 Add some colour to your summer drinks rotation with fresh blueberries! Click on the photo to go to the recipe. Don't forget about blueberries for your savoury dishes, whether it's an entree or a creative side dish. Click on the photo for the recipe. Blueberries are a lovely add in to a dessert recipe, either as the star or for a little extra sweet berry pop. Click on the photos to go to the recipes. Blueberry pie is a summer staple but you can also mix it up with a creative tart too! Click on the photo to go to the recipe. Whether it's a full on cake, bars or cute mini-pots, blueberry cheesecake is a winner! Click on the photos for the recipe. Everyone loves cake! And there are so many variations on blueberry cake recipes! Click on the photo for the recipe. Blueberry scones are a perfect accompaniment to a good cup of tea whether they're sweet or savoury. Click on the photos to go to the recipes. A big thank you to all our FBC Members who participated in our Blueberry recipe roundup!